You can integrate itopia with your ConnectWise account to get live data, ensuring your whole team has the customer information they need to provide excellent support. 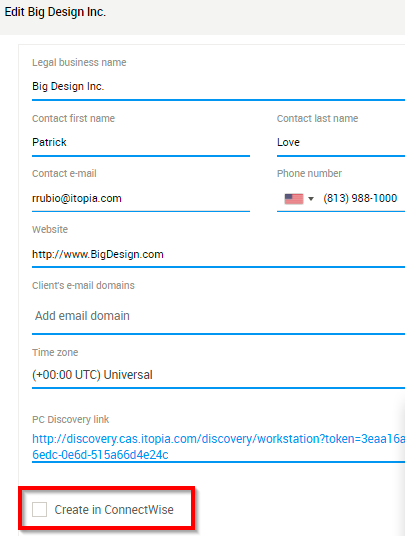 You can also send itopia information to ConnectWise. 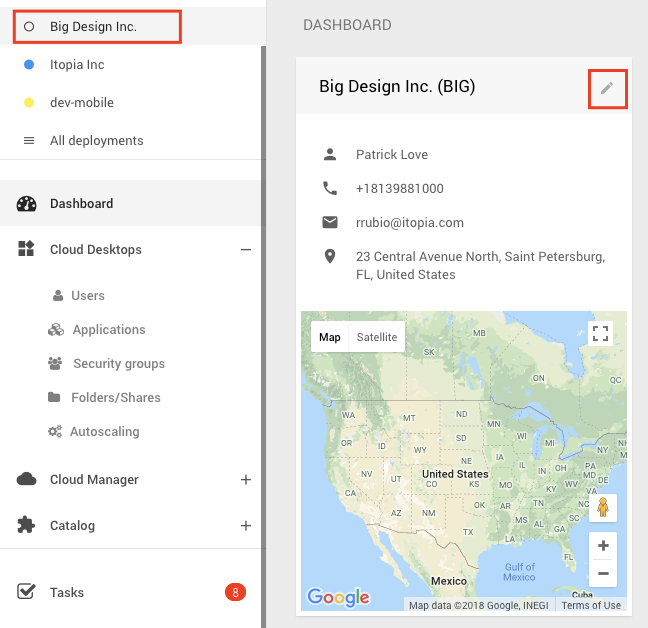 Get the context you need to provide better support with itopia data in your ConnectWise account. You can easily choose what information from itopia you want to forward to ConnectWise to ensure your teammates are kept informed. Open “Integrations” module from itopia main menu and just click on “ConnectWise” icon. 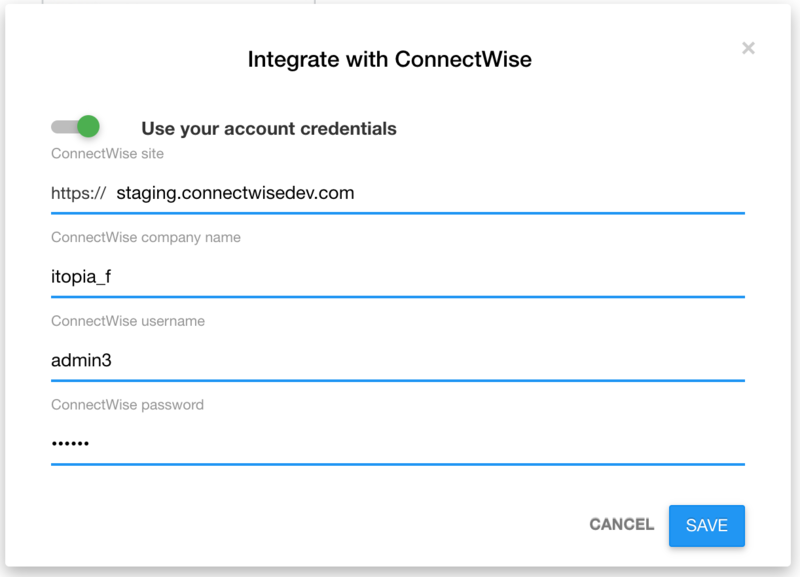 In the next screen fill in the ConnectWise website link you use, your Company name, and select if you want to "Use your account credentials" to set up the integration. Provide ConnectWise Username and Password. If not enabled, you will be asked for ConnectWise api keys. Please use this option if you're using 2 factor authentication to access ConnectWise. 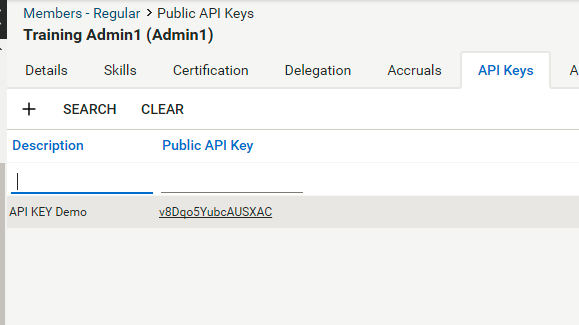 After copying the API keys, hit Save button and select the features you want to enable with the integration. Complete task upon ticket resolution: when you resolve a ticket that was generated by a task in itopia (option above), task would be autimatically completed as well. 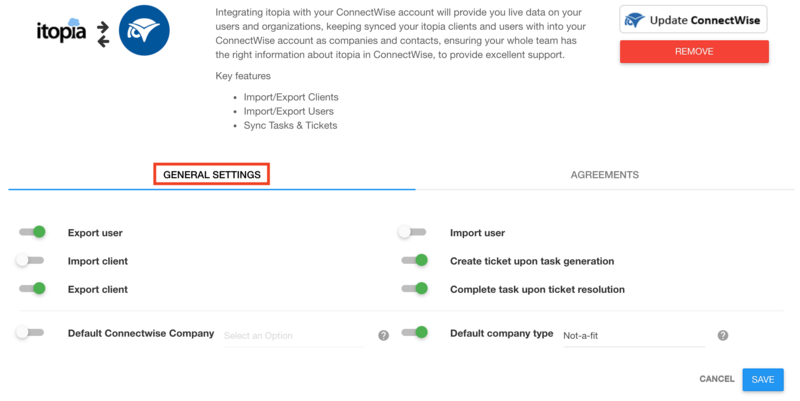 Default ConnectWise company: if enabled, the field allows you to select ConnectWise Company that the tickets from itopia will be created under. If the option is disabled, we'll automatically create a Company named "itopia ticket" with Company ID "itp_12813" and all your tickets generated from itopia will be created under said company. 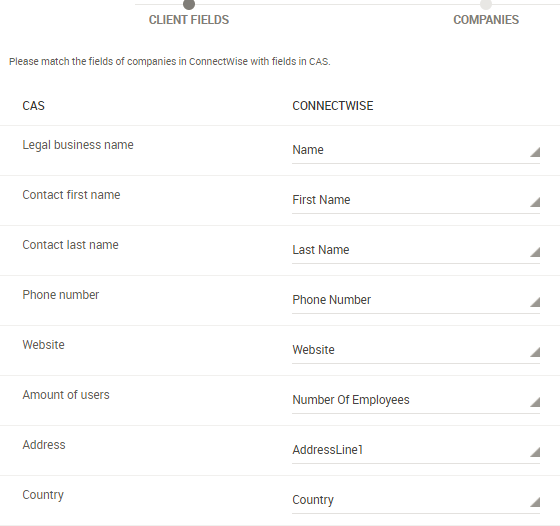 Company type: the integration can read the different Company types you have setup in ConnectWise. 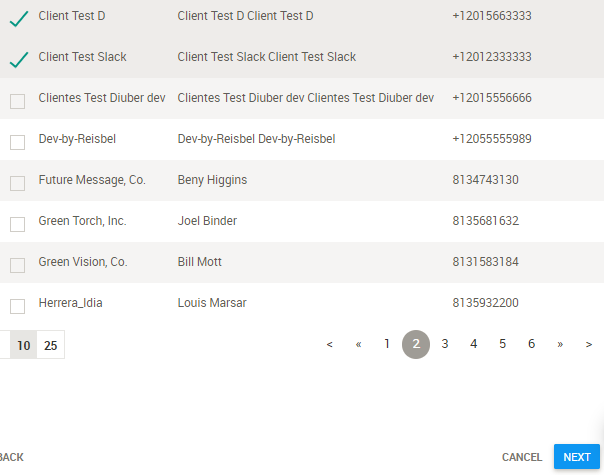 If you enable the feature, you will be able to select the Company type you prefer to use for the deployments exported from itopia. 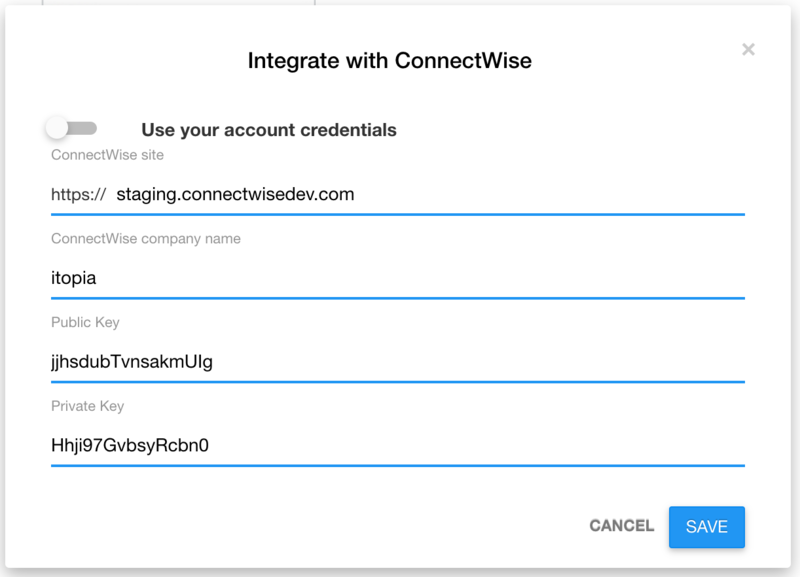 If disabled, the company used to export the deployments will be the default one that's configured in your ConnectWise account. After selecting the features, click on the Agreements tab. Here you can associate your itopia products (modules) with your products in ConnectWise. First, select the agreement on the right in "Deployment Agreements" section. The system will list all your agreements related to the Deployment. Then look at the Product definitions on the left and match itopia products with ConnectWise products. 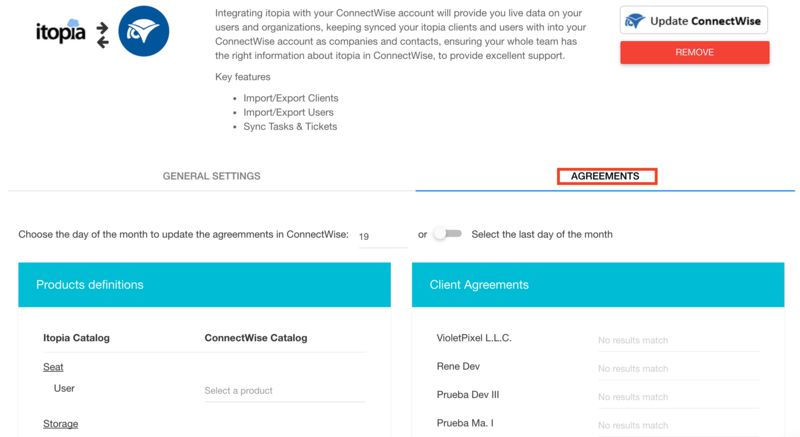 Don't forget to select the day of the month to update ConnectWise agreements to match the data in itopia. The option is available under Agreements tab as well. After your preferred options are defined, Save your settings. 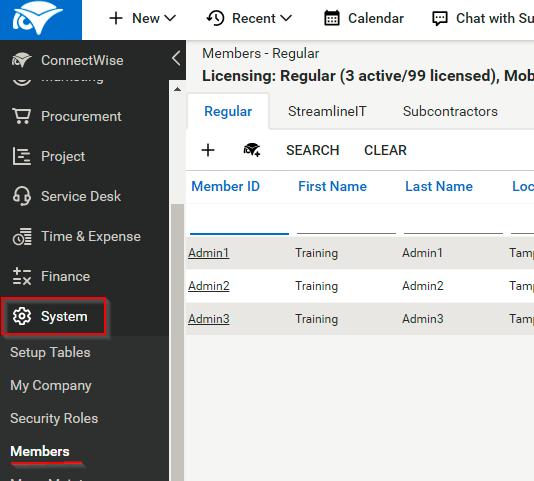 After the integration is done, create your existing itopia companies in ConnectWise. 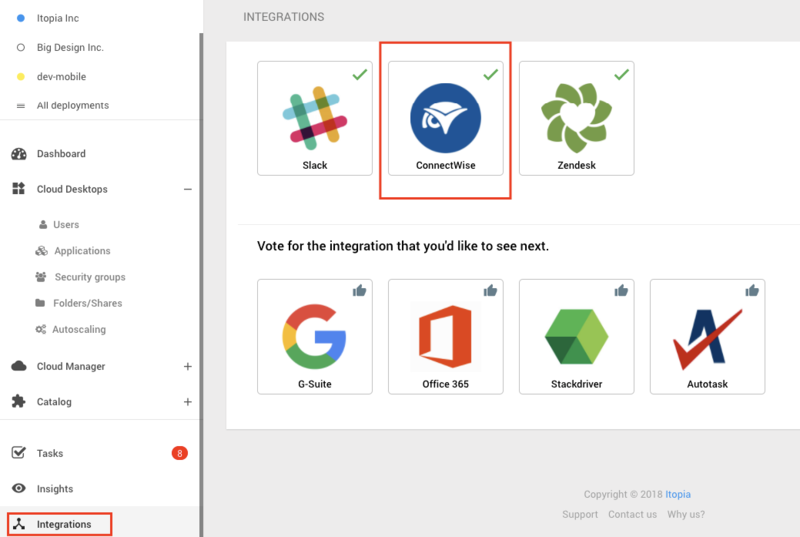 Go to Deployments, select the deployment you want to export to ConnectWise and hit the pencil icon. In the bottom you will get an option "Create in ConnectWise". Check it and save the settings. The company will be listed in ConnectWise under Companies menu. If the company already existed in ConnectWise with the same website and name, it will be automatically integrated. 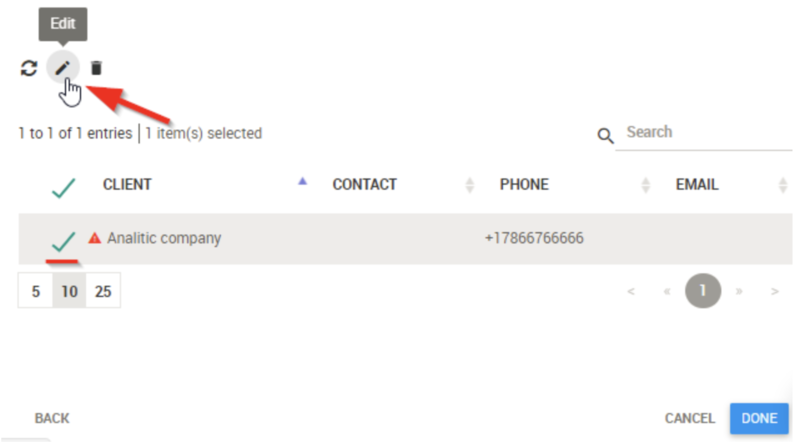 If the company website matches in both systems but the company name is different in ConnectWise, a ticket will be created in ConnectWise asking you to create the company in the system. You can also edit the name in ConnectWise to match the name in itopia. To edit the name go to Companies - select the company and edit the name. After that you can create the company from itopia again following the steps above and the companies will integrate. At the last step you may get a red triangle next to the deployment name. It means some of the fields are missing for the deployment. They must be filled in to finish the import. Check the deployment and click the pencil icon to complete the missing information. Once done, the red triangle will disappear and you will be able to click Done in the bottom right to finish the deployment import.